Visapur Fort Height is about 3567 feet.Distance from Pune to Visapur Fort base is 65 km approx & driving time is 90 mins.Whereas Distance from Mumbai to Visapur Fort base is 105 km approx and driving time is 2 hr 30 mins. Trek difficulty is Medium to reach the fort and it is a one day trek.Water availability portable water not available on the fort. You need to carry water from the base village. 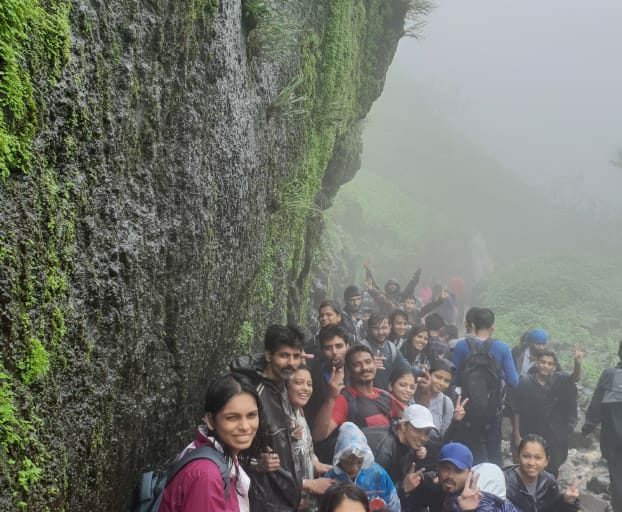 Visapur Fort can be a combined trek with Bhaje caves, Karle caves, Lohagad Fort& Bedse Caves.During monsoon it is one of the best trek near Mumbai.For Food purpose you need to place an order with the local villager and return to enjoy the delicacy. By Rail: The best way to reach Visapur fort by rail is to catch a direct train to Lonavala railway station, which is well connected to nearby cities and towns. From the station, you can hire a cab to the fort, which is situated at a distance of around 15 km. By Road: The base of the fort is well connected to other cities and towns by road. Hence, you can drive on your own directly to Visapur Fort. By Road: The base of the fort is well connected to other cities and towns by road. Hence, you can drive on your own directly to Visapur Fort. I pondered in thought how awesome it is today and how much better would it be in its prime time. The royal decoration, chariots and horses. Troop movements and troop camp with Shivaji Raje himself standing. As from Visapur one could get the entire view of Lohagad fort. As both forts are within striking distance, the British army captured Visapur and later also took over Lohagad fort. As i write my heart out and read aloud – gives me goose bump. Thou summit to Visapur Fort is an excuse it will always call you again and again. We start our trek with the Sun on our back and keeping Visapur fort to our left. There is a steep gradient uphill climb starting as soon as the trek path begin after a short walk. One can see the crumbled fortification of the fort to the left. A 45 minute climb should be sufficient. However this is suited for experienced trekkers only. We continue our walk ahead and 30 minute gradual walk brinks us to a village. We start our accent to Visapur from here. A good paced walking and we arrived at the entry to Visapur gates. Visapur is a vast fort it may take 2 hours to roam along the boundary walls. A couple of water tanks of the forts still have water even in early summer. There is also a huge horse driven flour mill with the grinding stone still in place. Bedse cave is a 2 hour 30 minute walk from the base village. Temple dedicated to Hanuman is also located on this fort. One can also find huge chiseled image of Maruti out of rock. A couple of isolated caves. As we wander you may even spot a few scattered cannons and numerous water cisterns.